There are some days you wonder why a product so obvious no one has thought of to create. And it solves some of the problems we face now. I am referring to a passive exchange traded fund (ETF) that tracks a local or regional real estate investment trust (REIT) index. Currently at this moment, there is no such a product, but there is a REIT index. Its name is called SGX S-REIT 20 index. And what we are hearing is some hearsay that an ETF like this might be approved. 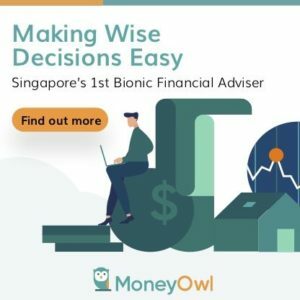 Here is my case why a REIT ETF like this will be very beneficial to the Singaporean Wealth Builder, whether you are starting off with $1400/mth or have build up a lump sum of $500,000 in wealth, at a time when you are near to financial independence. For reference, do review the SGX news on the latest performance of the REIT index here. What is a REIT ETF? REIT stands for real estate investment trust, which is a listed business trust that pools funds from you the investors and debts from banks and financial institutions to purchase a group of properties of a particular theme. This theme could be industrial properties, retail properties like your shopping malls, commercial properties such as the office places you work in, healthcare properties, overseas warehouses, hotels. For example, Capitaland Malls owned your favorite malls Junction 8, Tampines Mall, Bedok Mall, Mapletree Commercial owns Vivocity, Keppel REIT owns the MBFC that you work at, CDL Hospitality owns the hotels that tourist stayed at when they visit the region and Ascendas REIT owns the business parks that you may work in. It gives you the investors an opportunity to purchase a portfolio of properties with a smaller lump sum amount, compared to a $700,000 to $1,000,000 condo for investment. Like properties, they have capital appreciation (and negative capital appreciation) and a dividend yield from the rental that the tenants pay the manager of the business trust. As a REIT investor you gain the dividend yield and capital appreciation over time. For a list of popular REITs, their current Dividend Yield and Metrics, you can take a look at my Dividend Stock Tracker here. An exchange traded fund or ETF, is a fund somewhat like a unit trust, but listed on the stock exchange. You can see the price movement change daily, as the value of the underlying assets change. The ETF sought to mimic the value changes of a particular stock index, or asset index. Each ETF is based on a particular theme, just like a unit trust. In Singapore the most popular ETF is the STI ETF. The STI ETF follows the Straits Times Index, or the 20 largest blue chip companies in Singapore. 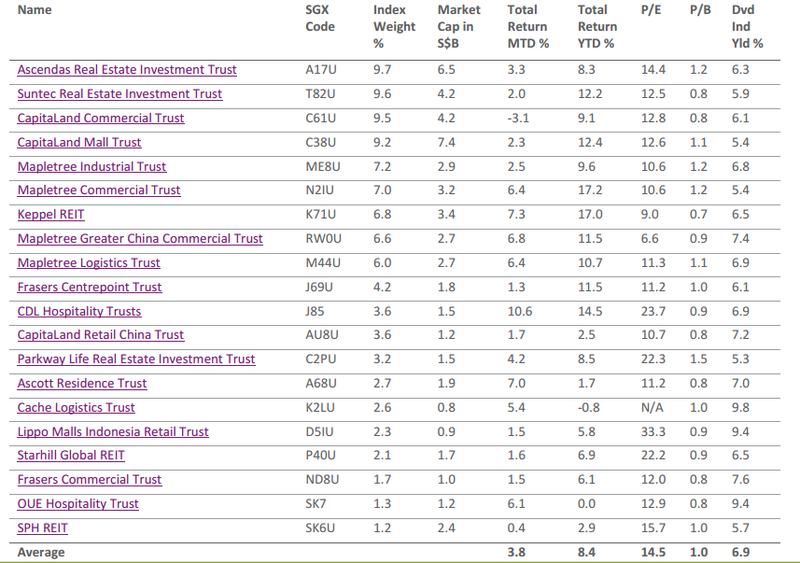 By purchasing such a STI ETF, you get to participate in the growth of 20 of the biggest companies in Singapore. You get to earn capital appreciation and a dividend yield. A REIT ETF, will be a listed fund that mimics the value changes of a REIT index. Last year SGX formed a REIT index called SGX S-REIT 20 Index. By purchasing this ETF, it enables you to invest in a portfolio of REITs, participating in the general property growth in the country. As an investor you will be able to earn capital growth + dividend yield. The SGX S-REIT 20 Index is a free-float, market capitalization weighted index that measures the performance of the biggest REITs in the region (in this case Singapore based). By Market Capitalization, we meant the biggest REITs. When you invest in an ETF that tracks the SGX S-REIT 20 index, you can earned the cash flow from the rental distribution of the underlying properties paid to the individual REITs and then to the ETF. If a REIT is doing badly and shrinks, and another REIT did well, the better performing REIT grow bigger and overtakes this poor REIT. The index is thus the survival of the fittest. Many in Singapore dream of owning properties in Singapore, but felt that it will take some time for them to build up a sizable amount for down payment. If you own a HDB flat and would like to purchase a $1,000,000 investment condo, a 20% downpayment will be $200,000, a 40% downpayment (if you have an existing home loan running) will be $400,000. An individual REIT already allows the investor who have $5000 to invest and participate in the capital growth and earning dividend cash flow. The buy commission is typically $29 or 0.18-0.25% of the transacted amount. This works out to be a 0.6% sales cost. A SGX S-REIT 20 ETF, trades like an individual REIT, and with the same $5000, you can obtain a diversification into a wider property of REITs and their properties at one shot. Since SGX have changed the trading lot size from 1 lot = 1000 shares to 1 lot = 100 shares, you can even get invested with $200 or $300. The only drawback is the commission will eat into your return, unless the commission in Singapore comes down. If you seek to build wealth, it is because you have a purpose or goal why you want to build wealth. One common goal is to be financially secure, and perhaps financially independent (read my formula on how much you need to be financially secure or independent). So you build wealth machines, which is a fundamentally sound way of building sustainable wealth in a certain method with certain assets. My idea is that many wealth machines, requires quite extensive time and effort on a recurring basis to ensure you build wealth in a sustainable manner. A portfolio of stock and bond ETF is one method that is relatively passive compared to the rest. However, as these top companies tend to pay out less dividends, they tend to have a larger growth component. For someone that requires their wealth machine to distribute more cash flow, a wealth machine based largely on the SGX S-REIT 20 ETF might fit the bill. Suppose that you have amassed $500,000 and believe that you require $2000/mth or $24,000/mth to be financially secure to do what you always love to do. If the prevailing average dividend yield of the SGX S-REIT 20 ETF is 6%, by investing the $500,000 in the ETF, the ETF potentially could distribute $30,000/yr in cash flow. This wealth machine is much more passive than you actively manage a portfolio of individual REITs because you do not need to spend time evaluating if the manager of the individual REITs are doing the right things to help you maintain and grow your REIT. As we have said previously, the index is more of a survival of the fittest. As a caveat, it does not mean the 6.5% dividend yield is guaranteed. Just like if you own a rental property, if there are vacancies, your annual rental income for that year will drop, if the economy is not doing well, and occupancy rate goes down, your dividend will be affected. If you are building up your wealth, and want to use something you can understand easier, doing it monthly, a REIT ETF such as this is also good. Suppose you earned $3500/mth gross, and have a disposable income of $2,800/mth, you can save up $1,400/mth for 3 months, and take the total of $4,200 to invest in a SGX S-REIT 20 ETF, giving you exposure to a very very diversified portfolio of properties. Readers who have read my materials would understand the way I look at REITs as an asset class. Properties to a large extend, can be very commodity like. The one that adds the most value is the quality of the manager of the REIT. It is a dream to find such a good manager, and while the REIT will tell you they work in a team, there will be periods where the quality of management becomes not good. As an active investor, you have to consistently assess their performance to pay attention to such signs. You do not want to see the case of a single poor REIT manager, in a challenging industry impairing a large part of your capital. Not having to access this risky aspect, for me, is one of the biggest upside. 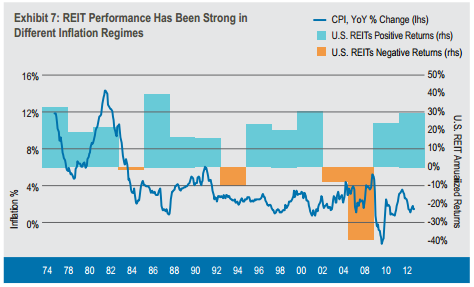 While many believe that interest rate is a big factor in REIT’s performance, I think it is very overstated. What is seldom mentioned in the same breath is the effect of a healthy growing economy on properties. While interest cost can go up in a rising interest environment, a rising interest environment won’t bring an economy down if the economy grows well. When an economy grows well, demand for industrial, commercial and retail property space follows as well. If you believe that in the long run, we should have higher productivity and this economy we live in has a good future, this SGX S-REIT 20 ETF is a way to participate in it. These periods tend to be inflationary, and as a wealth builder, you may be concerned if the investment preserves your purchasing power. In periods of inflation, the property values rises well, in periods of easing inflation, the REITs can take advantage of lower cost interest loans. 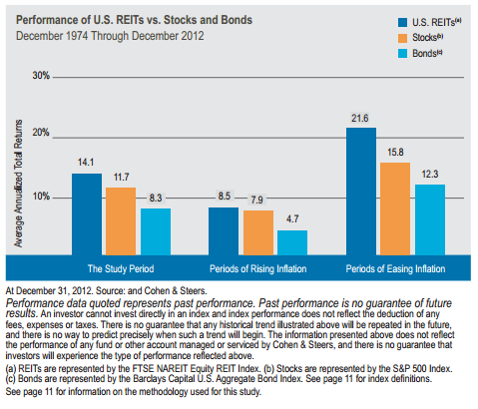 Here is another look at REIT performance in different inflation regimes. The caveat here is that different geographies may not exhibit identical trajectories. While the industry, compared to other countries is young, the industry have seen its fair share of problems. The industry have seen a credit crunch in the Great Financial Crisis of 2008, where many REITs could not refinance their loans and have to seek more funds from the shareholders for non-accretive loans. The industry have also went through much changes in governance, such as a shift in REIT management fees compensation from based on net property income and AUM, which tends to encourage mindless growing of a REIT’s asset under management. More REITs decides to link performance to dividends per share growth. You can read some of the REIT guideline changes here and here. Here is Ho Ching’s 2005 warning for REITs doing very drastic financial engineering. The financial crisis have surfaced some unknown risks, that the REIT manager didn’t know could be so bad. 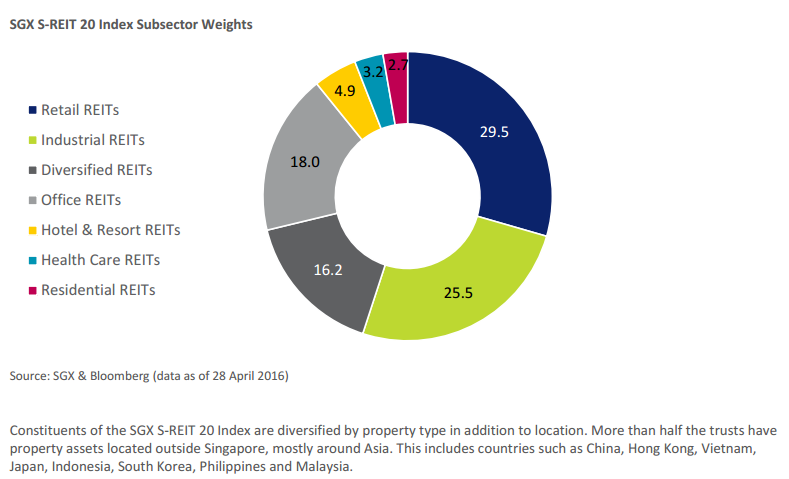 While the REIT market is rather young in Singapore, it tends to develop at a pace where more governance have reduces potential negative cultural issues that may plague the whole industry, which will negatively affect an entire portfolio of REIT based ETF. The second big problem for an active investor who purchases individual REIT is how they tackle the issue when the REIT attempts to raise a rights issue. A rights issue is when the manager wants to raise additional money from you the investor, to purchase a new asset, or to shore up their balance sheet. Many retail investors do not like REITs because they see the rights issues as “taking back your dividend”. It depends on how you see this, because Bobby Jayaratham in his Investing in REITs book, frames it as the manager asking you whether you would like to be part of an attractive property investment. If you are interested, you have to cough out more money. Since the index is cap weighted, it means the index is dominated by larger capitalization REITs. These REITs tend to be able to fund AEI, new property purchases with their slight increase in debt raising, or rental income not paid out. This reduces the propensity to call a rights issue. They may also be able to place out their shares to institutional investors better. As the ETF is diversified, it means that the amount of money an investor will need to cough out for rights issue is less per case study. This depends on how the ETF handles rights issues, whether they sell off the rights and not subscribe to it at a discount (in this case the investor like yourself loses value, not a good thing). Due to the diversification of the ETF, your losses on the selling of rights is dissipated. However, if another great financial crisis comes along and many of the REITs called for rights issue to shore up their balance sheets to pay down debt, this may not work out well for the SGX S-REIT 20 ETF investor. Singaporeans live in a tax haven compared to some other countries. There are no capital gains taxes on selling your stocks, and the dividends are a one tier tax at the company source. This means you do not pay another addition set of tax on your dividends. And there are no estate duty, or death taxes. These are the privileges we enjoyed and it may not occur to you, until you take a look at overseas investors who have to actively plan to optimize the taxes they paid on investments. If you are not knowledgeable, and did not put your REITs in your taxable account, you end up paying more taxes. For Singapore investors who have to purchase ETF in London or USA because of the limitation of ETFs in Singapore, they have to contend with estate duty and dividend withholding taxes. You always wanted to add a real estate tilt to your allocation. Perhaps you favor a equity, bond and real estate allocation. I will be honest here I heard such an allocation from a known influencer but I couldn’t remember who. All three asset classes on their own have a positive expected returns over the long run and the correlation might vary. This is what you want when you are constructing a portfolio. In the USA you could purchase a property for US$100,000 and that could be 25% of your allocation. In our case each condo will cost you much more. A viable alternative, the SGX S-REIT 20 etf allows you to form a 40%/30%/30% equity /bond/ real estate allocation. Some investors have chosen to put much of their competency in this dividend yielding asset class. Perhaps they have build adequate competence to evaluate each individual REIT such that they have an active strategy for it. One layer of evaluation that they might not want to risk manage is whether there are individual fundamental problems such as holding a portfolio that had a particular weak outlook versus the competition, or the manager have some debt refinance coming up at the wrong time. They want to focus on the under value and over value of the asset class as a whole. An ETF such as this abstracts away these problems so that you can focus on some of the industrial level problems and attractiveness. In the above table, you may evaluate and make quantitative investment decisions based on valuation and aggregate risk profile, versus regional REIT index. When you have an index, you can relate the aggregate REIT data, and make some quantitative valuation investment decisions based on whether the yield spread with the 10 year government bond yield is narrowing or widening, or whether the dividend yield is near to +1 SD of the average dividend yield. Do be aware that while an index abstracts isolated REIT issues to be less of an impact, if the issue is industry wide, it will be something to be evaluated as well. While there are many things going for the ETF, until the ETF is out, we won’t know about the yearly cost of managing the ETF, that is the expense ratio. While a passive ETF like the SGX S-REIT 20 ETF is managed by algorithms and machines, unlike the traditional unit trust managed by a manager who needs to earn his keeps, we think such a passive ETF will have low expense ratio, but we could be wrong. Why expense ratio is important is because, your returns over time is unknown, but what is guaranteed is the cost incurred. Returns compound. That is what we know and are attracted to. Cost compounds as well. And Cost is guaranteed while returns are not. The second unknown is whether the ETF constructed is using derivatives (synthetic) or the machine purchases an underlying basket of stocks (non-synthetic). I was honestly surprise that the traditional ETF houses like SPDR and Nikko didn’t explore this channel. There is one unit trust that does this in the market and that is the Phillip Singapore Real Estate Income Fund. This fund tracks the FTSE Straits Times RE Investment Trusts Index and its results are rather good at beating the benchmark index. (See Factsheet here). The index return is rather lukewarm, which makes us wonder whether the active manager has the advantage here. I think such a REIT ETF could be very useful to wealth builders who have very different wealth machines. Are there any positives and negatives I missed out? Would you be interested in an ETF such as this? Sorry, don’t mind me asking, is this REITs ETF available in the market now? Hi Kenshin, i wouldn’t mind. It is not. If not i would have put the link to it directly. I was thinking why its so obvious yet no one wants to do it. The reason that no one wants to do a REIT ETF is simply because there is no money to be made by the ETF providers. ETF providers portrait themselves as investors’ friends but they are really just like any other providers who are profit driven. A $50M REIT ETF (if any) with 0.2% management fee can only generate $100,000 per year for the ETF fund manager and simply cannot justify the cost. hi how do you propose retail investor make their own tracker.by investing in a group of reits? wouldnt that increase management complexity? In my humble opinion, SG REIT ETF will never reach 1 billion in the foreseeable future 🙂 Despite so much hype about ETF, SPDR STI ETF today has only $458M market cap. Phillip Singapore Real Estate Income Fund (which mentioned in your article) has only $46m fund size despite it is an active fund and actively promoted. So I doubt a REIT ETF will ever has more AUM than the phllip fund. For most retail investors, an active fund such Phillip Singapore Real Estate Income Fund will mostly track the index performance after fees (if not outperform), because the performance of REITs are largely foreseeable based on economical cycle. This should be the base of the portfolio. The investors then can overweight certain sectors by purchasing a couple of individual REITs. For example, if you think retail sectors will outperform, you can buy a CapitaMall REIT to boost it. I think STI contains 30 components, instead of 20? Anyway I am looking forward to the S-Reits 20 index ETF. yes you are right, i think i might have made a boo boo there. Perhaps it’s due to reits generally being less liquid the blue chip names on SGX (ie: simple snapshot – total $volume for blue chips vs reits). Might not be much of an incentive for securities firms to make the market in a reit ETF. if liquidity is an issue, then perhaps this ETF might not work out that well? Yes that’s what I suspect. If the underlying securities (be it listed stocks or OTC traded bonds) aren’t liquid enough, it’s going to be tricky to create an ETF on the said underlying securities. A pretty liquid market on the underlying is best to have, to attract arbitragers in order to make the market for the ETF. Or maybe it could be that there aren’t enough reits floated onto the market yet. Hi Kyith, yup I’ve often wondered if such a REIT ETF would make sense. However I think that no ETF manager can do better than the Philips Unit Trust – unless you can scale this much larger, the ETF will suffer from poor liquidity and high expense ratio (the Phillips trust is 1.29% for retail investors!!). Compare this with the Vanguard REIT ETF in the US.. 0.1% mgmt fee! Perhaps the best option for retail investors is to do DCA monthly into a portfolio of REITS using POEMS SBP or MaybankKE’s monthly investment plan? Think the Phillip REIT fund chart assumes dividends reinvested, hence total returns captured. Benchmark is not total returns. Hi Drizzt, thanks for covering this. The REITs ETF is a no brainer. Just DCA into it. At the end of the day just live off the 6%. The only thing that can better it is another REITs ETF with a better-constructed index and lower cost! hi momo, is a no brainer but someone updated me we are in a unique situation in that individual reit dividends isn’t taxed. but if you set up a fund, there are corporate tax on the fund. that would somehow affect its returns. Hi. That didnt cross my mind and it may be true. However i think the benefits still outweigh the costs. So for me its still a no-brainer! DCA here i come! Btw there may be a mistake in your saying it is a market cap weighted index. Actually it is not pure market cap weighted which is what i would have preferred. The SGX S-REIT 20 Index is an adjusted free-float market capitalization-weighted index that measures the performance of the 20 largest and most tradable REITs listed on SGX. not my mistake but perhaps my mistake in interpretation. what is the difference there momo? Hi Drizzt, I just want to let you know that I have followed your blogs for many years and it is one of the most informative blogs on dividend investing. Great stuff! I’m not sure if I have missed it but what are the downsides or cons of investing in REITS ETFs? How do I then compare this to individual stock-picking REITS in the dividend stock screener? Is it still worthwhile to go through this effort of stock-picking or will REIT ETF become a better approach to dividend investing in future? hi SP, thanks for the support all these years. the downside of the REIT ETF is that if you treat it as this asset class is the be all end all, and do not equipped yourself to know that there will be times this asset class is not going to be doing very well, then that will be a problem. there are of course things you can do with individual reits because you might be able to spot reits that are better performing versus the average, and choose to overweight on them. these are the 20 largest cap reits, and you might not want to go for the largest since its difficult to acquire and move the value of a large cap reit. at the end of the day, the effort is up to you to decide. right now if you buy a combie of areit, cmt, and cct you probably have something like such an index. if you want less surprises but forgot a higher yield, or the potential of greater capital gains, then this reit have a lot going for it. I am yearning for an ETF like that. Thanks Kyith for your detailed analysis. Hopefully some of the people in Nikko or SPDR read it and accelerate their efforts to launch it. There are so many ETFs in the market which have low liquidity. I am sure a REIT ETF would garner much higher liquidity. I have so many friends monitoring the REIT space, but being lost on which of the 39 REITs, Trusts, and Hybrids to put in their long-term portfolio. With an ETF we could buy into all of them for a well-balanced broader risk-spread dividend income. Can you please share to cons of having the Phillip Singapore Real Estate Income Fund? Some of the related cons is that the active manager might under performed, or that the main manager will leave. What is the tax treatment of REIT dividends for a fund vs an individual? Individuals aren’t taxed but will a fund have tax free status too? If not, perhaps it’s better to invest individually? Firstly, thanks for these articles! pardon me as i am not very savvy in these areas. i have 2 main questions. 1) as this article was written in May’16, now in April’17 there is the Phillips APEC SGX Reit ETF yes? So my questions is, why is it that the article states 12%? does it refer to Dividend yield + Market Gains ? please advise, thank you and appreciate your advise. Nikko AM Straits time Asia exJapan REIT ETF was launced and listed a while ago. Perharps this is near to you have been looking for ? This ETF is not bad and very diversified. But as a fund there is a 17% corporate tax on the dividends, so you have to be ok with that.